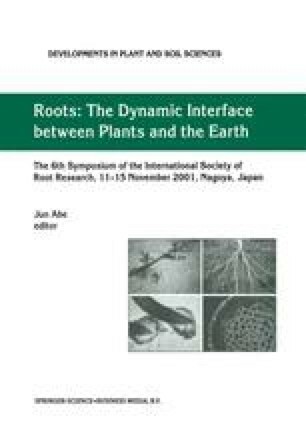 The effects of different fertilization regimes on root growth characteristics, nutrient uptake and biomass production of Japanese larch (Larix kampferi Sarg.) and its hybrid larch (L. gmelinii × L. kampferi) seedlings were examined for one growing season. Seedlings were raised in the greenhouse under three fertilizer levels (10, 20, 40 mg N seedling−1 season−1) and two delivery schedules, conventional (C) and exponential (E) for 12 weeks. Root growth, biomass allocation and nutrient loading capacity of seedlings were measured for a 3-week interval. By the end of growing season, seedlings fertilized with low dose conventionally (10C) and exponentially (10E) developed relatively longer root and larger root surface areas than those fertilized at high dose exponential loading (40E). At final harvest, the 40E treated Japanese larch had 134% and 155% more shoot mass as compared with those raised under 20E and 10E treated seedlings, respectively. The seedlings fertilized under 10C and 10E showed a high root mass ratio, while 40E treated seedlings showed a low root mass ratio. These data indicated that different nutrient levels (10 mg, 20 mg and 40 mg) strongly affected root growth characteristics. The same seasonal dose (10 mg) applied exponentially (10E) accumulated more N in seedlings compared to the 10C treatment. Exponential fertilization enhanced an increase in N concentration of the whole plant suggesting exponential delivery schedule is an efficient fertilization technique for greater nutrient uptake of plants. In contrast, N concentration of whole plant was declined for seedlings treated with conventional fertilization due to growth dilution. Late in the growing season, seedlings raised under 40E did not significantly improved dry mass production of root, but nutrient accumulation increased without a concomitant increased in root dry mass production. The result suggests that seedlings fertilized exponentially at medium and high dose rates (20E and 40E) induced luxury nutrient consumption within the plant.